The busiest part of the shop is hammering out custom cabinet and decorative hardware for Hill Iron Works. 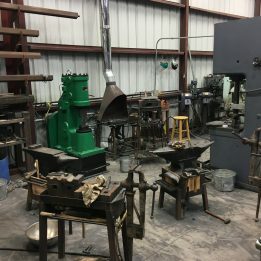 A 450lb and 500lb anvils and a swage block anvil stand in center. A coke forge and a gas forge in the background. 25 ton hydraulic press on the right.